by Paul Gilster, writer and author of “Centauri Dreams”. 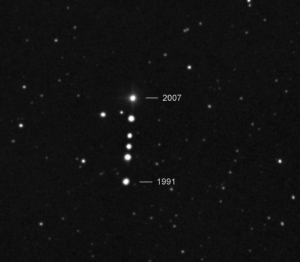 The proper motion of Barnard’s Star between the years 1991 and 2007, an indication of its proximity to our own Solar System. Barnard’s Star has already produced its own share of notoriety. Working at the Sproul Observatory (Swarthmore College, Pennsylvania), astronomer Peter van de Kamp examined 2,413 photographic plates of the star taken between 1916 and 1962. The astronomer observed what he believed to be a telltale wobble in the motion of Barnard’s Star that fit the profile of a planet about 1.6 times Jupiter’s mass in an orbit at 4.4 AU1. He would later suggest the possibility of two gas giants here2, and by 1973, Oliver Jensen (University of British Columbia) and Tadeusz Ulrych had upped the number to three3. If confirmed, these would have been the first planets ever detected outside our Solar System, but it was not to be. 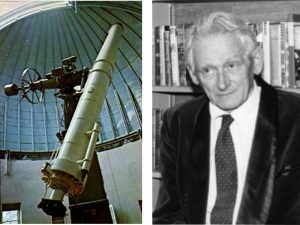 Follow-up studies by George Gatewood (University of Pittsburgh) and John Hershey (also at the Sproul Observatory) found systematic errors in van de Kamp’s work. The culprit: Lens adjustments to the Swarthmore instrument that were later confirmed by Hershey when he found an identical wobble in the M-dwarf Gliese 7934. Subsequent work by Gatewood and, later, Jieun Choi (UC Berkeley) would be able to detect no planets5,6. So what do we have today? We can rule out gas giants at Barnard’s Star thanks to continuing Doppler monitoring, but we can’t yet rule out small rocky planets of the kind we are now turning up around other M-dwarfs in data from the Kepler mission. Kepler has shown us that planets of a few times Earth-mass are not uncommon, while a 2013 study by Ravi Kopparapu (Pennsylvania State) found that about half of all M-dwarfs should have Earth-size planets in the habitable zone7. What might Red Dots uncover around this tantalizingly close star? 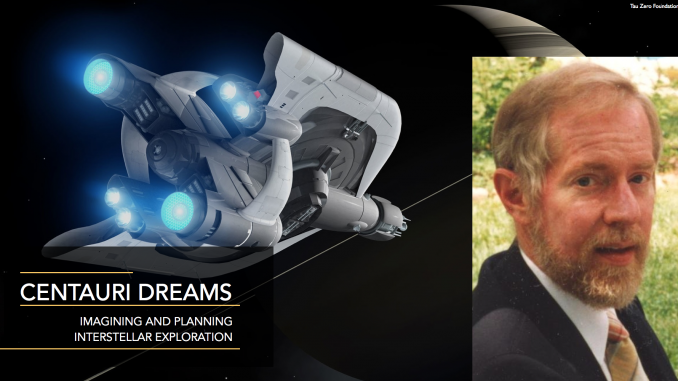 Paul Gilster writes and edits Centauri Dreams, tracking ongoing developments in interstellar research from propulsion to exoplanet studies and SETI. 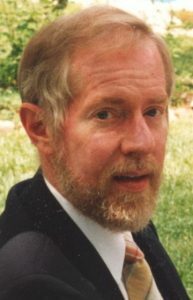 A full time writer for the last thirty-five years, he is the author of the books Centauri Dreams: Imagining and Planning for Interstellar Flight (Copernicus, 2004) and Digital Literacy (John Wiley & Sons, 1997). He is also one of the founders of the Tau Zero Foundation and now serves as its lead journalist. This organization grew out of work begun in NASA’s Breakthrough Propulsion Physics program, and now seeks philanthropic funding to support research into advanced propulsion concepts for interstellar missions. Gilster has contributed to numerous technology and business publications, and has published essays, feature stories, reviews and fiction both in and out of the space and technology arena.